Get crocheting out there! Spring is up and your saddles should reflect that... These DIY saddle covers might not be rainproof, but they sure are chic and spring-like. See the 'how to' (in Danish) & credits on the website for Hendes Verden - a Danish women's magazine. Here's the same page translated from Danish by Google. I doubt it helps... :-) There are lots of crochet abbreviations that don't translate well. But hey, we tried. Which bike would you prefer to ride? nice. 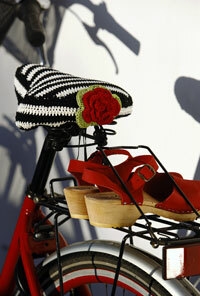 I'd like the bike with the cute shoes on the rack! The one with the red rose and clogs! Although the quilt on the back of the other looks quite nice. 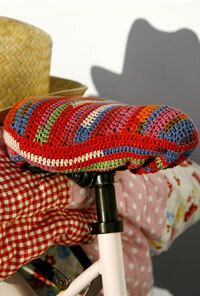 I have a pattern for a crochet seat cover, but I haven't made it because they can be quite bumpy after 30 minutes. Maybe I'll give it a whirl, anyway. Someone should try hawking a couple of these on their website or ebay (hint,hint)! stripes and the rose, oh so flirtyyy! Lovely, never thought of something like that. What a fabulous site. I've used it for a post and I hope you don't mind that I've used a picture as an example of the site.